Ch-ch-ch-chia! Do you remember those Chia Pet commercials that aired in the 80’s where these cute little plant holders would grow sprouts that looked like hair? Well, the seeds that were used are what you see in many health food stores today – chia seeds. In addition to making a cute potted plant, chia seeds are a good source of fibre, protein and omega-3 fats. They are grown in Mexico and Guatamala and are sold in both black and white varieties. They look like poppy seeds (except they are even smaller) and can be used a variety of ways because they are neutral in taste. Chia seeds can be sprinkled on salads, added to soups, smoothies and oatmeal. They become gel-like in consistency when added to water so some people make them into a pudding or use them as an egg substitute. Unlike flax seeds, they don’t have to be ground up in order to be digested. One tablespoon of chia seeds contains 2 grams of the omega-3 fatty acid alpha linolenic acid (ALA). ALA is a plant based omega-3 fatty acid which is also found in flax seeds, walnuts, tofu and vegetable oils. Health Canada recommends that men aim for 1.6 g of ALA/day and women aim for 1.1 g ALA/day. There is currently no upper limit set for ALA.
For people who don’t eat a lot of seafood, tofu or nuts and seeds, I can see how having a tablespoon of chia seeds can be a good alternative to getting their omega-3’s. I know that I personally have a hard time ensuring that I get enough omega-3’s each day so it’s nice to see that chia seeds contain so much in such a small amount. The folks at Nutiva were kind enough to send me 400 g bags of their black organic chia seeds which retail for around $14.99 (depending on where you shop). I know a lot of my colleagues have heard about chia seeds but have not had the opportunity to try them so I sent them around to give us all a chance to try them out and share our experiences. Have you tried chia seeds? How do you use them? What do you think of them? Thanks for giving me the opportunity to test out the Nutiva Chia Seeds! I used them as an egg substitute in a cake mix (Betty Crocker- devil’s chocolate), to make cupcakes. I mixed the chia seeds with 3 parts water to 1 part chia seed to form a paste which I added to the batter. The chia didn’t affect the taste of the cupcakes at all, it’s a great substitute in that regard! It did affect the texture of the cake however, as the seeds didn’t completely dissolve. I’d recommend them more for muffins and loaves rather that finer pastry or cake recipes. I look forward to using them again in banana bread, zucchini loaf, and maybe even some seasonal pumpkin recipes! Chia seeds have lots of nutritional value and that’s why I intend to incorporate them into my diet. I am gluten/dairy/egg sensitive, and it’s invaluable to have alternatives like this to help recipes bind together (like eggs do), without affecting the taste of the final product. I’d rate the product a solid 4 out of 5 stars- if it was ground into a powder it would have been a full five star rating because it would increase the versatility. Hey, thanks for letting me rate the product. I used the product as a topping in a variety of ways: I added to oatmeal, sprinkled it on my smoothie and on top of yogurt and fruit. I also added it on top of my salad. 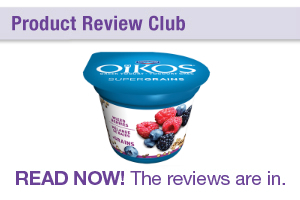 the product has a nutty to bland taste which I liked – it didn’t overpower whatever I was eating. Yes I would use it again. I’ve heard of chia seeds but have never had the chance to try them. I’m so glad I got to try them through the product review club. They had a slight nutty taste but what I noticed the most was the gel-like texture (similar to tapioca) when I added liquid. I really didn’t know how to eat them so I made the chia seed cereal recipe that was on the back of the bag (a combination of chia seeds, hemp seeds and milk). It was kinda like a chia seed oatmeal which was quite good. I also tried them on their own as a cereal which reminded me of cream of wheat but with a more gritty texture. I actually liked them the most when mixed with oatmeal because that’s what I eat most mornings and it’s a nice way to add some omega-3’s and extra fibre (plus the oatmeal provides a creamier texture). I also learned that it can be used as an egg substitute (1 Tbsp chia seeds + 3 Tbsp water = 1 egg) which worked well in a muffin recipe that I tried. It’s nice to know that I can always use chia seeds for certain recipes if I am short on eggs (and it’s also a good substitute from a heart health perspective). It’s a great way to add some extra fibre and omega-3’s into my diet and it’s easy to do. I also like the fact that it comes in a sturdy, resealable pouch. I would definitely recommend chia seeds as a healthy option for people who want to get more omega-3’s in their diet. I used the chia seeds in 2 ways. First, in my oatmeal in the morning. They added a bit of visual interest, but no real taste or texture. They also got stuck in my teeth 😉 Second, I added chia seeds to a dried coconut and panko bread crumb mixture that I used to bread baked chicken. I liked the visual interest the seeds added to this recipe. And I could hear them kind of toasting and popping in the oven! The seeds didn’t change the taste of the recipe at all and that was just fine. Overall, the chia seeds are not exciting for taste but the nutrition profile is impressive. I’m all for adding seeds to my diet! I mixed in the chia seeds into some of the foods I regularly eat, such as yogurt (with sliced almonds, yum!) and tuna salad. They added a nice visual element and a bit of crunch, without overtaking the foods. They don’t have a distinctive flavour, so they didn’t change the flavour of the yogurt or tuna salad either, which I liked. They are really easy to use and I would definitely continue to use them knowing how much fibre and omega-3 fats are in a single tablespoon. I used the chia seeds in two ways. I wanted to make a breakfast porridge, so I used chia seeds with red quinoa for this. Also, I put the chia seeds over my salad for added crunch. In both instances, the chia seeds added a nice texture to the product, more so noticeable in the salad than the porridge. I didn’t notice any taste difference because the seeds are rather tasteless. They are so easy to use in any recipe, and the added benefit of knowing just how nutritionally sound this product can be motivates me more to use them in a wide variety or recipes. Adding a tablespoon of seeds to your recipe is just so simple, especially when they’re so high in fibre and omega-3 fats! Thank you for allowing me to taste test the Nutiva chia seeds. I was able to do different things with the chia seeds. I first sprinkled some in my yogurt which added an interesting texture to it. Then I made chocolate chip banana muffins and sprinkled them on top of each muffin before baking them. It turned out great and added some crunchiness to it (even my husband liked it!). Then I did sprinkle on top of salads as well … just make sure you don’t have some chia seeds stuck between your teeth! I am gonna use chia seeds instead of sesame seeds or poppyseeds … Next recipe I have in mind is to sprinkle it on top of make rolls … Overall, a great product that I already recommend to my clients. I am sold! Thank you for the opportunity to try the chia seeds. So far, I’ve used them in oatmeal and yogurt – both of which I thoroughly enjoyed. Like others have said before, they don’t add much in the way of taste. But I did enjoy the tapioca ball-like texture. I was also really pleased that my picky two year old liked it as well and did not turn up her nose at strange black seeds in her hot cereal. Next project – pumpkin muffins with chia. I too am impressed with the nutrient profile and would definitely recommend it to others. The only drawback is the price (and sounds like also availability depending on where you are). However, it is a large package that should last awhile. I used the chia seeds on cold cereal, hot oatmeal cereal and in banana bread. It doesn’t really have a taste. I like the crunch it adds. Interesting texture as it forms a jelly coating when in contact with liquid. People with texture aversions may not be big fans. Cold cereal a lot of it fell to the bottom of the bowl so might not be the best use. Oatmeal cereal couldn’t notice a taste, just the crunch/texture. I would add it again. Loved it in the banana bread. Just added it to the recipe, didn’t use as a replacement for egg or anything. Even the hubby liked it! One drawback is they get stuck in your teeth! It does add visual appeal or another dimension to your product (ie. banana bread). Overall I liked the product and would use it again. Especially since it is high in fibre and omega 3 it’s a good subtle way to add these nutrients to your diet without having to eat a large portion. It mixes well into a variety of foods. I would recommend them! Thank you for this arena to share my experience with the chia seeds. I must say I was pleasantly surprised at their nutritional value! I tried them straight out of the bag and was not so impressed as I found them to be quite benign. I decided to blacken them to see if that made a difference. I used a small cast iron fry pan to blacken them dry without oil over high heat. Since the seeds were black to begin with I had to rely on the scent and cracking sound they made to tell me they were “done”. I added these blackened seeds to a cold beet salad. The salad consisted of cold beets sliced into slivers, white vinegar, oil oil, mixed baby greens, blackened chia seeds, purple onion and feta cheese. The crunch was a nice addition to this salad and the taste was very subtle. I also experimented with 2 banana loaves; one with plain seeds the other with blackened seeds. This did not make a huge difference in taste but I did notice a small difference in the texture of the banana bread. The blacked seeds kept there size and crunchy texture, while the plain seeds tended to add a bit of “moisture” for lack of a better term to the banana bread. My thoughts, it is an easy way to add nutrition, namely protein and fibre to a recipe. I plan on adding them to a muffin recipe and replacing poppy seeds with chia…lemon chia muffins…here we come! Other thoughts…adding them to a tofu salad and adding them to my flour and bread crumb coating for fish! I was pleasantly surprised to find out chia seeds would thicken with water and be taste neutral which is exactly something I needed to use up some ground sesame seeds in my fridge. I decided to make a common popular asian dessert which is more like sesame pudding. This dessert normally takes some work as you need to toast up some sesame seed, grind up some rice, add water and force the mixture through a sieve several times before heating it up to thicken the mixture with some sweetener for the pudding. Instead, I tried to mix up the ground roasted sesame seeds with some chia, sweetened condensed milk and some water: sesame pudding in an instant. It didn’t turn out too bad, it had a lot of potential. The taste was there but I think blending the chia finer would help. If you grew up with these types of desserts, you could appreciate the ability to whip up these desserts quickly and healthily without having to resort to store-bought packets with questionable fillers. I would definitely like to try chia seed in similar asian desserts (almond, walnut, red bean + coconut …) for the added health benefits. The chia seeds are used in my house mainly to go on cereal in the morning. It’s hard to rate the flavour of something that as a rule doesn’t have much flavour… Whether this particular brand is a winner depends on what you want in texture. If you like chia seeds that absorb a lot of liquid quickly and bulk up for good fibre, this may not be the product for you. These ones tend to stay drier longer. That’s a plus if you want the dry consistency with its graininess, but less so if you like it softer. It was great to try Chia seeds from Nutiva. I used this product as a topping on foods such as cereal and yogurt. I also added it to pasta salad and a rice and vegetable stir fry. Finally, I included it in a fruit and yogurt smoothie. The product combined very well with all of the foods I added it too, except for the smoothie. Seeds are not usually to smoothies anyway! The taste was minimal in the dishes. From a healthy eating standpoint, the seeds are a simple way to add extra fibre, protein and essential fats. Often nuts and seeds are overlooked protein alternatives. I was surprised to learn that they can be easily digested without being ground. Glad to know that we can access their nutrients without grinding. Overall, I would rate this product 4 out of 5. The price is reasonable considering the size of the bag. It was a pleasure trying out this product! I must say that I too was very impressed with the nutritional profile of the chia seeds, but didn’t know what to do with them. There was one recipe on the bag – but some ideas for people would be helpful. I tried putting a tablespoon in my yogurt – that was very do-able and an easy way to add 5 g of fibre. The texture was “seedy” and crunchy – that was OK. I think I would prefer it this way – rather than soft and mushy – however I didn’t like the fact that the seeds did stick in my teeth. Once I tried chia in a drink – where the seeds were floating… not really my cup of tea! I think people need ideas of how to use the chia seeds! I could easily add it to my smoothie in the morning – which I often blend. I could also see myself adding it easily to an apple crisp topping which I often mix up anyway but adding different ingredients. Would I use it again – absolutely! I love trying new foods..but I wasn’t adventurous enough to go out and find some recipes. Making it easier with ideas on the bag or saying there are recipes on a website would be a great addition! I soaked them in water first, so I was adding more of a gelatinous glob to the apples rather than a bowl of seeds (that DO get stuck in your teeth!) . The result was delicious, and I didn’t need to add any cornstarch to the applecrisp. Since the cold weather is approaching, I tried using my Chia seeds as a hot oatmeal breakfast substitute. I measured out a small amount of chia seeds and let them sit in boiling water before I added in a small amount of milk and brown sugar. I found I didn’t enjoy the gelatinous glob of chia seeds even with the milk and brown sugar. I’ve also tried Chia seeds in muffins as an egg replacement, I found them gave the muffins a bit of crunch which I liked. If I use the seeds again it will be in baking or in salads, definitely not an an oatmeal replacement! Thank you for sending me the Nutiva Chia Seeds to try. I used them in my morning oatmeal, love the extra texture it added. Also made an energy bar with it (recipe below), loved it myself and tested it with a few friends, everyone loved it. The seed only have a very mild nutty flavour and add texture to what ever it is added to, which I like. I will continue to use chia seeds from now on, also I love the bar I made so I will be making again and again. Love that its a super food, helps me get omega-3’s, fibre + protein. The product itself I would rate at 5, however the packaging, nice as it is, didn’t see any symbles regarding it being bio-degradable. If your going to sell an organic product you should package it in something bio-degradable. So that causes me to rate it at 4. Puree dates in a food processor until a thick paste forms. Add cocoa powder, chia, cinnamon, vanilla + almond extract. Pulse to conbine. Add almonds + pecans, pulse till nuts are well incorporated. Stir in cherries. Form one bar in an 8×8 pan, score into 8 bars, put in the fridge for 2 hours. These little seeds are so fun to use! I added some to my orange juice this morning because there was a picture on the bag of a beverage with the seeds floating in it. After letting them sit in the juice for a few minutes, I noticed (as everyone has been commenting) that the seeds started to form a gelatinous coating around them which actually was neat because if you swallow them with the juice without chewing, it doesn’t cause any swallowing issues. However, when I did chew them, they DID stick in my teeth (Not something that would deter me enough from eating them again, though). I liked that they added little to no flavour so they can be used practically in anything, their nutrition profile is excellent for someone like me who generally gets a lot of fibre during the week but the weekends can be a challenge, and I can take them with me since it’s in a conveniently resealable bag! I also tend to overlook my EFA intake when pondering over my meals, so that it is also an added bonus. I didn’t like that they stuck to my glass after I finished my juice (which kind of defeats the purpose of adding them in). Another way I used them was in baking. My favourite thing to bake are these banana walnut muffins and I usually spoon on a butter and brown sugar topping before putting them in the oven. This time I added some chia seeds and it really added to the texture. It kept its crunchy texture days after, too! I tried the Chia seeds mainly in my yogurt with fruit for breakfast or in my salads. I thought it added an interesting crunch but not so much taste. They do stick in your teeth though, so it’s probably best to check your teeth before you step out! I like the fact that it’s ready to use and that you don’t have to grind them (like flax seed for example). I liked the product and would use it again. 4 stars out of 5. I sprinkle Chia seeds on my salad. The chia seeds do not have much taste and it feels like there is poppy seeds in my salad. I have salad everyday so I find its an easy way to ensure I have omega 3 in my diet. As a person who does not fish or seafood is is nice to find an easy way to fit omega 3 fats in my diet. The best part is it does not have to be ground like flaxseed. Chia seeds cost more than flax but it is more convient. I will definitely keep using chia seeds. Thanks for letting me try this product. I have used Chia seeds before, but I usually buy them at bulk barn. I liked the convenience of a resealable bag. I usually put some of the seeds in yogurt or a smoothy to add some omegas to my diet. Don’t put too many, as they really thicken the liquid. Recently I found a new recipe to make a really quick chocolate pudding and a great midday no guilt dessert! I don’t think they have a real distinct taste, but like the crunchy slimy texture. According to the above recipe, the seeds shouldn’t be crunchy after sitting in milk for a few hours, but these were. I will continue using these seeds, but I have been reading about their side effects and it mentioned that too much of them can cause constipation, so just have to make sure that I do bot overeat the pudding! Thanks for the opportunity to try chia seeds. I used them on my oatmeal in the morning. They are a bit smaller than I had thought and I didn’t notice much taste although they added a bit of a crunch, which I liked. It seems like you could add them to many different foods without altering the taste of food but adding nutrition. I would definitely try them again and they are a great alternative to sesame or poppy seeds. I will probably try to bake with them next time. Thank you so much for the opportunity to use the Nutiva Chia Seeds. We know this is a healthful product. That’s a given. For me, it’s not about the taste as much as the texture of this product. It can be crunchy, pulpy, or silky. I have incorporated chia seeds in many baked goods. I use chia seeds in the place of poppy seeds. Using the chia seeds straight up in a bundt cake, results in the seeds staying very crunchy. If this is an issue, soaking them in the liquid, usually buttermilk, milk, yoghurt, or low fat sour cream, does the trick. Two cakes that I used to test the chia seeds are in a wonderful Austrian Chocolate (Poppy Seed) Cake and a bundt cake. The Austrian cake required grinding the seeds. For the bundt cake either leave them for really crunchy texture or soak them to incorporate them into the batter for a smoother taste. Once you eat the product, it can sometimes stay in your teeth, just like poppy seeds. It takes on a pulp like nature in your mouth. I teach international cooking. These seeds work well as a topping for falooda, a fragrant rose syrup enhanced ice cream noodle sundae. Traditionally basil seeds are soaked and used as a topping for this Middle Eastern ice cream treat. It kind of works like a tiny version of tapioca pearls. I have been eating these chia seeds with a bowl of yoghurt as a midday or evening snack or light lunch. The serving of yogurt is topped with a serving of fruit and a tablespoon chia seeds, a tablespoon of hemp seed and two tablespoons of sunflower seeds. I add a tablespoon of organic maple syrup if I crave a sweeter version. This dish is very satisfying and delicious, especially with the understanding that the health properties from Health Canada are conclusive and supported. Thank you for the opportunity to rate this product. Chia seeds are a relatively new product to me. I recently attended a class on raw foods and they used Chia seeds to create a dessert pudding when added to almond milk. I liked the gelatin-like texture and how it absorbs the liquid. I found chia seeds to be very similar to tapioca. It’s also a very nice addition to yogurt. Not much flavour but a great source of fibre! One comment on the packaging – I like the resealable bag; however, this product was mailed to me and the seal did not remain sealed. Great Product! I always have “overnight” oatmeal for breakfast (1/3 cup dry oatmeal + 1/3 cup yogurt + 1/3 cup milk + berries and cinnamon let sit overnight), first i put a tbsp of chia in and let it set overnight, however i found it gave an off flavor, the next day i tried putting the chia in right before i consumed in the morning ! Much better this way – adds extensive nutrient value and keeps you going all morning! I also made homemade chia seed strawberry jam – 1 tbsp water + 1 tbsp chia seeds + 1 cup fresh strawberries, I mashed the strawberries first and then put in the chia and water and let sit for a couple hours before serving on toast !! It tasted even better the next day! It was a pleasure to try Nutiva’s Organic Chia Seeds. Chia seeds are extremely versatile, as they are nutritious, and can be added in numerous ways to your diet. I sprinkled them over my morning parfait and then over my pasta at lunch. It gave both dishes an extra crunchy texture. I also tried adding them to my homemade banana bread for more fibre, protein, and essential fats. Overall, I find that chia seeds tend to take on the flavor of the dish very well. Chia seeds provide a significant amount of omega-3 fatty acids, which has been linked to heart disease prevention. You can also find omega-3 fatty acids in flaxseeds but they must be ground to gain the benefits. The advantage of chia seeds is that they don’t need to ground to gain the same benefits. Although they have their nutritious perks, I would use them in moderation, keeping in mind that one tablespoon provides 60 calories. Overall, I would rate the product 4 out of 5. I look forward to finding more ways to add them to my cooking. Thanks for letting me try Nutiva’s Organic Chia Seeds! I used these chia seeds in my morning smoothies, sprinkled on top of my peanut butter toast, and mixed into my yogurt. I love the delicate crunch and neutral taste. I look forward to using them quickbreads or savoury dishes to add extra nutritional value. Chia seeds are a great way to add omega-3’s, fibre and protein to my diet and they don’t need to be ground up like flaxseeds which makes them even more versatile. Chia seeds have always been a staple in my kitchen. I like chia seeds because they’re rich in fibre and heart-healthy omega 3 (ALA). They can soak a lot of water, thus helping you feel full for a longer period of time, but make sure you drink lots of water! Once the seeds soak the moisture (e.g. from milk, almond beverage), they have slimy texture. The organic chia seeds from Nutiva come in a blend of the black and white variety. I can’t detect any difference between the two in terms of taste. I use chia seeds mainly to make chia pudding – they’re great for breakfast or snack. To make chia pudding: mix 1 cup of milk/ almond, coconut, or soy beverage + 3 tbsp chia seeds, then stir, and stir, and stir until well-mixed. Some of my favorite pairings for chia pudding are: 1) honey, pistachio and Greek yogurt, 2) pomegranate, and 3) mango passion fruit. During cooler weather, I like to add chia seeds to my hot cereal. Would I use this product again? Absolutely. 5/5 stars for Nutiva’s organic chia seeds! I had heard of chia seeds, but this was my first try to eat them. Surprisingly, they were not too nutty, crunchy and so nutritious! So far I’ve used them for the home made bread, yogurt, oat meal, and on top of the salad. I haven’t tried them soaking in the water to get jelly texture, but I would like to try it sometime soon. It’s hard to say what they taste like…not really that much tastes on its own. To me, they’re like crunchy poppy seeds. I would definitely use it again as I like the texture and the nutritional value. Also it is easy to use as I do not have to grind them. From a point view of healthy eating, they are great addition of omega-3 to diets. Also, they are high in fiber and in protein, which is awesome. The best part is that I don’t have to grind them, simply I can sprinkle on top of something. So I give it 5 stars! And I’m gonna tell other friends about this as I really like it! Thank you for the opportunity to review Nutiva organic chia seeds. This has not been my first time using chia seeds, but I haven’t had them from Nutiva before. The Nutiva chia seeds are similar to other chia seeds I have used in the past. I used the chia seeds as a topping to my morning oatmeal and I made coconut chia seed pudding. The seeds do not have much of a taste at all. They provide interesting texture to foods (as they absorb a lot of water). Some people may not enjoy the texture of the seeds (they can be a bit slimy) but I think they are great. The chia seed pudding is also very filling which makes it a great snack. I will continue to use them in my kitchen. From a nutritional standpoint, chia seeds also offer a good amount of fibre and omega-3’s for a small amount of seeds, and the seeds do not need to be ground in order to absorb the omega-3’s. This can be great for anyone wanting to increase their fibre intake or who may not get omega-3’s from other sources. Definitely 5/5 stars from me for this product! 3)	beyond being a good source plant-based omega-3 fatty acids and fibre, they are also a good source of calcium, phosphorous and magnesium! Thank you for the opportunity to review the Nutiva chia seeds! I have been using chia seeds for about a year or so and love them! I have not had a chance to try this brand specifically, but have tried others including white chia seeds and ground ones. Chia seeds are great as they deliver a great punch of fiber and omega’s for a small amount, but are also very versatile. I have used them in baking for breads and as an egg substitute and also in smoothies and puddings. My favourite way to prepare chia seeds is by making a chia seed pudding. Traditionally I combined plain Greek yogurt, almond milk, maple syrup and chia seeds and leave it to set overnight. In the morning I will use the pudding as a fiber rich “fruit and yogurt parfait” by topping it with berries and toasted almonds. Overall I would rate the product a 5/5 for it’s nutritional profile and versatility. This product is great! My boyfriend loves it too, which is great! It’s can be used so many ways which is great. We often sprinkle it on the top of yogurt and fruit in the morning to get some omega’s into our day. They don’t taste strong or impede on the taste of the fruit or yogurt which is great too, they just a a bit of a crunch and pop with we both like. I think they are a great way to introduce a healthy food choice into your life. The additional fibre they add into your day is a wonderful bonus too! Thank you for sending me a bag of Nutiva Organic Chia seeds to sample. I was thrilled to get a large sample of the chia seeds because I have been really interested in experimenting with chia seeds in the following areas: egg substitute, xanthan gum substitute, and fibre-weight management tool. #1: Ginger Lime Blueberry Chia Seed Jam, where I used ground chia seeds to replace the pectin and sugar used to gel jam. I was happy with the results. #2: Chocolate peanut butter chia seed pudding: Didn’t like the texture, but my toddler loved it! #3: Berry chia seed overnight oatmeal: Loved the addition. The oatmeal masked the gelling properties of the chia seeds, yet the chia seeds improved the texture of the oatmeal. #4 Chai Spiced Chia Seed Granola: The chia seeds didn’t add any specific flavour, but definitely contributed to the crunch, fibre and protein for this recipe. 1/2 cup of granola with milk and berries filled me up all morning, and didn’t leave me ravenous for lunch. The chia seeds didn’t gel up when I added milk either (maybe because they were toasted, or because I ate the granola before they had a chance to gel up). #5: The next recipe I used chia seeds in were my gluten free muffin recipe. I added 3 tbsp ground up chia seeds to the recipe to see if they would help with the binding, as you can see below my muffin recipe was crumbly. Turns out the ground chia seeds helped improve the binding of the flours, but also smoothed out the gritty brown rice flour texture. I still have some work to do on this recipe, but it was quite insightful. #6: I used the chia seeds in my gluten-free oatmeal cookies to try to replace the eggs. I want to still work on this recipe, as the cookies got really hard really fast (not baby friendly, but taste good when I dunk them in my coffee). #7: I tried my hand at “vegan xanthan gum free gluten-free bread”. The chia seeds were to replace both the eggs and xanthan gum. All my attempts did not turn out, but there are too many factors involved to say that the chia seeds had a role in why the bread did not turn out. I don’t blame the chia seeds for this flop …but more so my lack of knowledge of how different gluten-free flours and gums work. I’ve only been at dairy-free/gluten-free baking for a few months now, and the learning curve is steep. Overall, I am so glad that I’ve had this time and opportunity to experiment with chia seeds and I do highly recommend consuming them. I learned that I don’t like the texture of them on their own after they have been sitting for a while, but mixed into recipes they add a unique texture that I do enjoy. I really like chia seeds when they are crunchy and enjoy them in smoothies. They remind me of kiwi seeds in a blended drink. The chia seeds have mild nutty taste, but really don’t contribute any flavour to recipes. I think the nutrition profile of chia seeds is pretty good for fibre, protein, calcium, iron and omega 3, but like any seed oil you have to be mindful of the calories from fat. 1 tbsp = 60 calories. I did find that just a small amount 1/2 tbsp added to a glass of water did help me feel full …although more isn’t always better, as they do swell in your stomach (and one day after a lot of testing I felt fairly bloated). 1 tbsp of chia seeds is giving you 20% of your daily fibre intake, but you are consuming 60 calories to do so. Up until I discovered chia seeds, I’ve been using psyllium husk as a fibre booster in recipes, which in 1 tbsp you get 5 grams of fibre for only 20 calories, but it is void of any omega 3s. I will be using chia seeds again, as I love the idea of using unprocessed ingredients like chia seeds in allergy friendly baking. Thank you for providing me with the opportunity to sample this product. I was able to use this this product as a topping to some of my common foods, such as in oatmeal, cold cereal, with boiled green bananas, or in stews/pasta mixtures. I did as well try the product plain and noted its bland taste and nutty texture. It is an excellent way to add some nutritional benefits to foods without significantly altering the taste or texture. It also can add more visual appeal to a plate by lightly sprinkling the seeds on top of certain foods. I would definitely use this product again and refer it to others so that they may benefit as well, especially those who find difficulty with changing their diets. I have always enjoyed using chia seeds – so with this sample I tried using them a few new ways! I love that they add nutrition without changing the flavour too much. I used them in overnight oatmeal – it took a few trials to get the consistency right, but it definitely is a great way to add even more fibre to breakfast! I also used them to make a homemade granola bar (recipe from http://blog.nuts.com/homemade-granola-bars-recipe-gluten-free/) – the chia and ground flax are used as a binding ingredient in the granola bar, showing off the versatility of the chia seed! These granola bars were a hit with friends and co-workers! I added them into my regular homemade muffin recipes – which worked great, just remember to add a bit of extra moisture for them to absorb! I will certainly continue to use chia seeds regularly for the great nutrient profile and am always on the look-out for new recipes to show them off in! Thank you for giving me the opportunity to try out the Nutriva chia seeds. I used them several different ways. First I added them to my morning oatmeal. They are fairly neutral tasting so didn’t add much in terms of flavour, however, I do like the impressive nutrition value that these little seeds add to my morning meal. The second recipe I tested was chia seed pudding: Soak 2 tbsp chia seeds, ½ cup unsweetened almond milk, 1 tbsp cocoa, 1 tsp vanilla, and a touch of maple syrup in a small bowl for 2 hours in the fridge. It was quite delicious! I loved the texture that the chia seeds had when they absorbed all of the liquid. It was a great treat that is still quite nutritious. You could add a bit more maple syrup or honey if you prefer your treats to be sweeter. I also testing the chia seeds in homemade raspberries jam and it was perfect! I will definitely be purchasing this product and will recommend to other as well. Thank you so much for the opportunity to provide a product review for Nutiva organic chia seeds. I used the product in my overnight muesli which also contains large flake oats, oat bran, wheat germ, sunflower seeds, pumpkin seeds, almonds, raisins and cinnamon. I really like how the chia seeds act as a thickener and help to soak up the milk overnight. 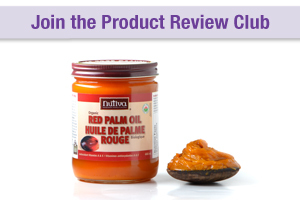 I would definitely use this product again and was thrilled to read all the other reviews with recipe suggestions! It has definitely given me some more ideas on other healthy ways to use chia seeds. Overall I find the flavor very neutral (which I am happy about). I like the fact that they increase the fiber in my breakfast and are a source of omega-3 fats. Thanks for sending me Nutiva organic chia seeds to sample. I have used chia seeds in the past and find that they’re a great item to have on hand to get more omega-3s. One of my favourite ways to use them is in a batch of overnight oats. I have also added them to smoothies (waiting for them to gel before consuming). I used this sample as a way to try some different recipes (you can see a few ideas on my instagram profile – http://instagram.com/langdonsteph) and made coconut pudding, pumpkin cranberry energy bites, and quinoa chia bars. I find that they have a mild/neutral taste which adds to their versatility and ease of use. I would definitely use them again and continue to try different uses for them. I don’t mind the gel consistency in smoothies, but wasn’t as big of a fan of the pudding texture. Like any nut or seed, I think they’re great to add variety and nutrients. They can be used in small portions which makes the price more reasonable. They’re also interesting because they can be used as is or once they’ve absorbed liquid to become gel-like. I was already happy to get to sample the Nutiva Chia Seeds, but was pleasantly surprised to find myself with a full sized bag of them to play with. Chia seeds are a product I have used many times over the years (you might call me a chia seed hipster). While I had never tried the Nutiva brand, I found them to taste and act the same as any other I have tried. They have basically no flavour, so they are a great addition to plenty of different foods when you want to add a kick of nutrition – they have fibre, protein, and omega-3’s. You can use them as an egg replacement in some baking, or to make a great pudding or breakfast parfait. These particular ones I used in some smoothies for their thickening properties – great when you aren’t using frozen fruit. I think they are fun to play with in recipes because of their gelling properties, but I can also appreciate that some people might be turned off by that texture. But I think that even if you aren’t into that texture, you can use them in baked goods to add nutrition, and not even notice they are there. Would I use them again? Of course! I’m not going to stop now. And if someone is interested in them, I would have no issues recommending them or helping them fit them into their diet. I have used chia seeds in very simple ways by sprinkling them on top of yogurt and cereal, or blending them into smoothies. Last night was the first time I actually tried to cook/bake with them. I made whole wheat banana walnut muffins with Greek yogurt and chia seeds. The muffins turned out great! To be honest, I don’t taste the chia seeds at all because they’ve softened and are overpowered by the banana and walnuts. I think this is a good thing! The last thing I want is my regular muffins to have a weird texture or seedy/nutty aftertaste that takes away from the flavour I want. What’s better, I decided to be risky and triple the amount of chia seeds recommended (3 tablespoons instead of 1), and it didn’t seem to have made a difference except improve how nutritious the muffins were! I definitely like the nutritional profile of chia seeds and how they can easily boost the protein, fibre and omega-3 content of my foods. Considering how easy they were to incorporate into most baked goods, I’ll be using them much more often than I have been! Like another reviewer mentioned, you just have to be mindful of the need for extra moisture in the recipe.